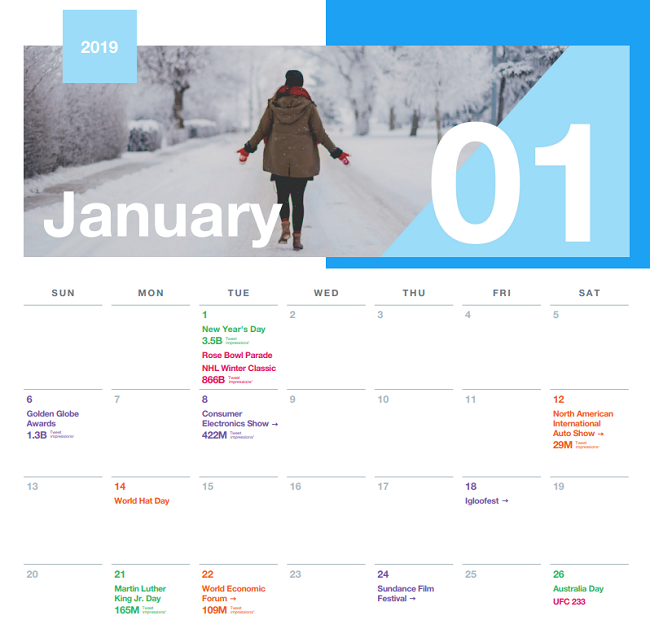 This will certainly help in your 2019 strategic planning – Twitter has this week released a new 2019 major events calendar, which highlights all the key dates of note, along with indicators of previous tweet volume related to each event. Twitter releases monthly major event calendars throughout the year to remind businesses of upcoming dates they should be aware of, and which they can tap into to boost engagement. Now, you can get a head start on all the key dates, with the entire calendar available for download (via email sign-up). Each month also includes a listing of event lengths, while the calendar listings themselves are color-coded, so you can easily see which are most likely to be related to your business. Helpfully, Twitter has also included three versions of the calendar this year – this (above) is the US version, but you can also download a UK and Ireland listing, as well as one specific to the Middle East region. Twitter’s event calendars are always a popular, and beneficial tool to have handy, and it’s definitely worth downloading the 12-month calendar for reference, in order to ensure you’re tapping into all the relevant opportunities.